WHAT IS AN ANSWER, AND WHY SHOULD I FILE ONE? An Answer is typically a set of documents that are filed with the Court in response to a Summons and Petition (Law Suit) you have been served with by your county sheriff or an individual authorized to serve process. A Summons is a legal document issued by a Court in response to a Petition/Complaint that has been filed naming you as the Respondent or Defendant in a law suit. For example, dissolution of marriage (divorce) is considered a law suit. In Florida, once a Summons is issued, it is sent to the sheriff or a process server located in the county where the Respondent/Defendant resides. Often, service of a Summons comes as a complete surprise to the person receiving it, and people often feel embarrassed or intimidated when a Deputy shows up at their doorstep with his patrol car parked in front of the house. 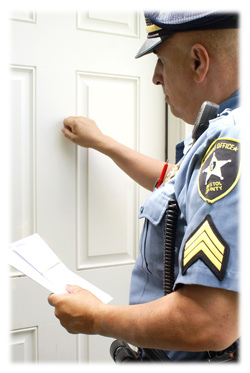 Every week across the country, Sheriff Deputies and other Civil Process Servers visit people’s homes and businesses to serve civil process, usually a Civil Summons. The Summons will have a complaint attached that details the reason and the basis for the lawsuit filed against you. A copy of the Summons will be served on you along with a copy of the original Petition. There may also be other legal documents attached to the Summons. Once you are served, the Deputy Sheriff or Process Server will mail the original Summons back to the Petitioner along with an affidavit of service attesting that you were properly served in person or by constructive service if permitted. These papers are then filed with the Court. Receiving a Summons is never fun, but you shouldn’t panic. Once you are served, the clock starts to tick. It’s probably not a good idea to ignore the Summons and do nothing. If you decided to file an Answer to the complaint, you have to do it within a certain period of time. Once you are served with a Summons, you will usually only have twenty calendar days to file your, “Answer” with the court. This is typically not the time to argue your side of the case. In an Answer, it is common to simply agree or disagree with the allegations made in the complaint. You will have your opportunity to present your side of the case, your witnesses, and any evidence at a later time. If you fail to prepare and file your Answer within the twenty (20) day period, a default can be entered against you, and the Petitioner (the person suing you) may get what they want by court order without any further input or involvement from you. If you have legal questions, or need legal advice or representation after being served with a Summons, it’s best to consult with a licensed Florida Attorney. We can refer you to a local attorney or the Florida Bar’s Attorney Referral Service. If you want to handle this process yourself, as a pro se litigant, Florida Document Specialists can assist you with document preparation and filing your answer documents with the Court.